Put 4 glasses into the freezer and leave them for several hours so that they get ice cold before using. Crush half of the shortbread biscuits. Put 2 tbsp of strawberry sauce into the bottom of each glass, then place a shortbread biscuit on top, to separate the liquid at the bottom from the other ingredients. 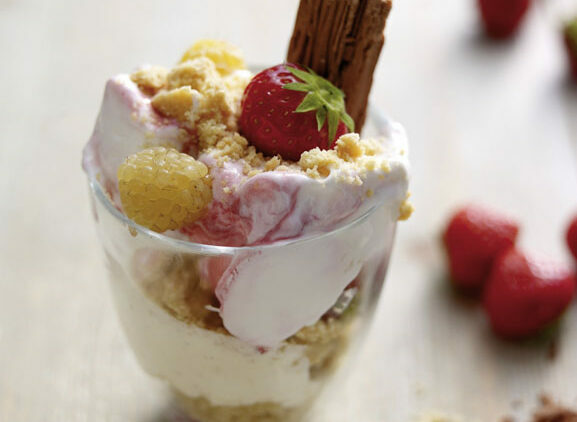 Add a layer of ice cream and then follow with alternating layers of fresh fruit, crushed shortbread, strawberry sauce and ice cream until the glasses are full, finishing with crushed shortbread and a few fresh berries. Top each knickerbocker glory with a chocolate flake and serve straight away. My favourite fruits are strawberries and raspberries, but blueberries and blackberries are also great. In late summer and early autumn try mixing berries with stone fruits, such as plums, apricots or peaches. To prepare stone fruits: simply rinse and add to a syrup made from 50 percent water and 50 percent sugar that has been brought to the boil. Poach the fruits in the boiling liquid for 2 minutes, then leave to cool in the liquid. If it’s jelly that makes your glory for you, set it in the bottom of the glasses before you start layering, or set it in a container and spoon it into the glory.